Would you like to make rag doll shoes like those Eleanor is showing off? They look rather complicated don`t they? Well I have news for you, they are really quite easy and you can make them in no time. Just choose a color to compliment her outfit. 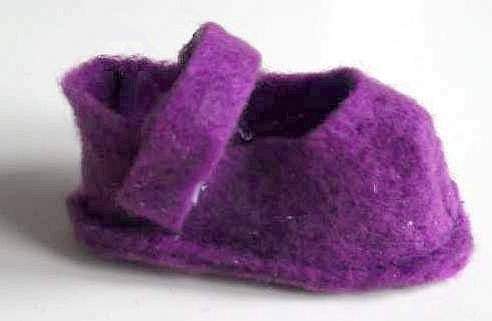 Felt is a nice fabric to use and doesn`t fray. So lets take a look at the list of stuff you will need. 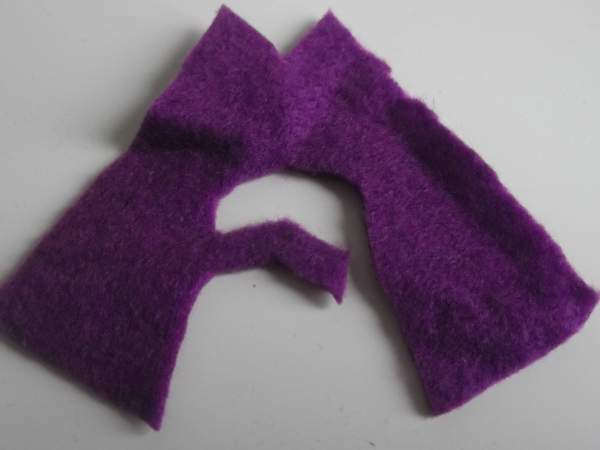 Fold the felt and place the 3 pattern pieces along the fold as I have done in the photo. Make sure the top part of the shoe and the strap in placed on the fold. 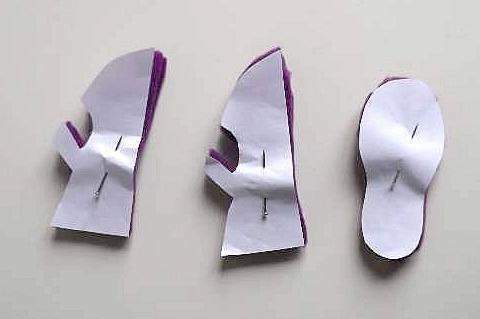 Now carefully cut them out. 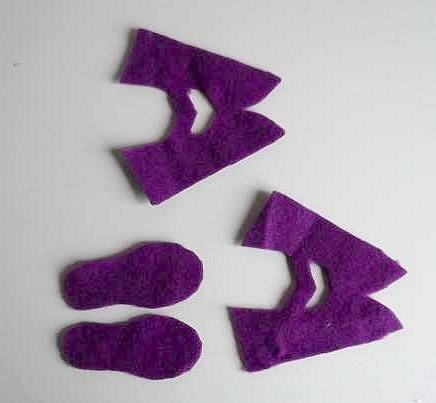 When you open them the upper shoe parts will look like an A shape. The soles should not be joined together. If you need a closer look, enlarge the pictures by clicking on them. On each upper shoe cut 1 side of the strap away. Cut it on the left on one and the right on the other. This is the strap and the fastening will fix onto the end. 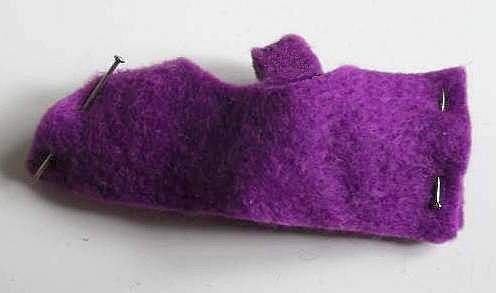 Use a glue gun if you have one and bond a thin strip of felt over the strap to strengthen it. It needs to be longer than the strap so that it overlaps at both ends. 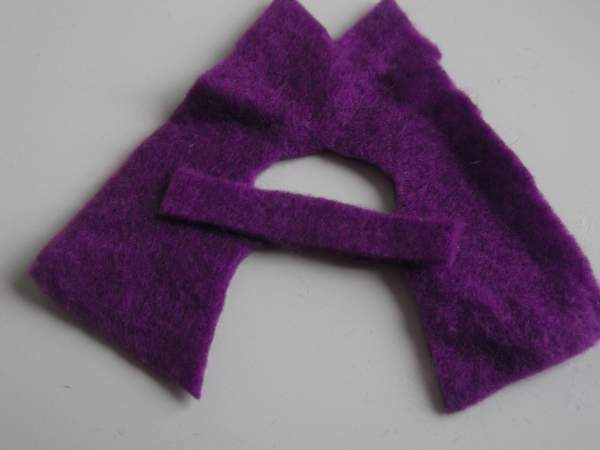 If you don`t have one, attach and strengthen it by sewing several times along the strap. Trim any bits sticking out. 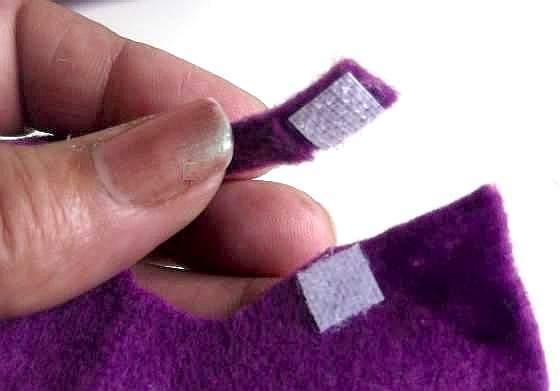 Attach a very small piece of the hooked Velcro to the overlapped end facing down. Now attach the soft part to exactly where the strap wants to lie. I also used the glue gun to bond them on. Sewing Velcro can be very hard. 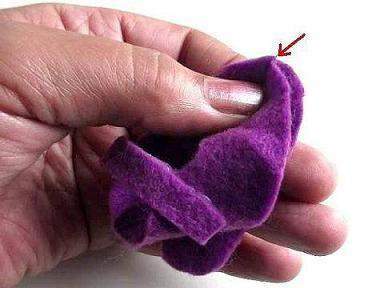 You will need a thimble if you do, or you can machine stitch them by turning the wheel with your hand. Pin and stitch the toe and heal of the shoe making sure the straps are on the inside. Then turn them out. The next step is a bit fiddly so you can stitch it by hand if you find the machine too difficult. 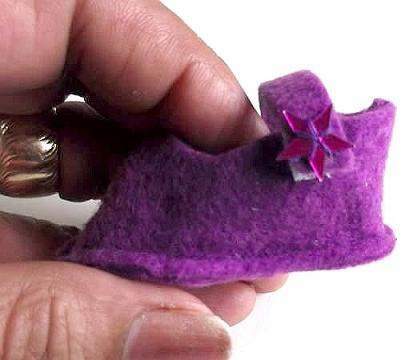 Pin the seam at the toe end to the center of the toe end on the sole. Now pin the heal seam to the sole heal. Stitch around the shoe fitting the upper with the sole. 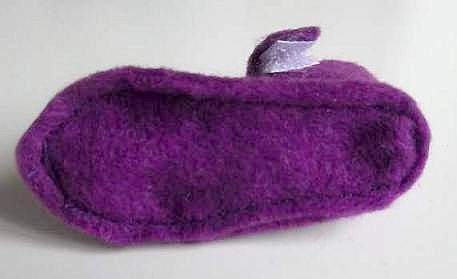 The felt allows you to ease it into place. Ok, tricky bit done! 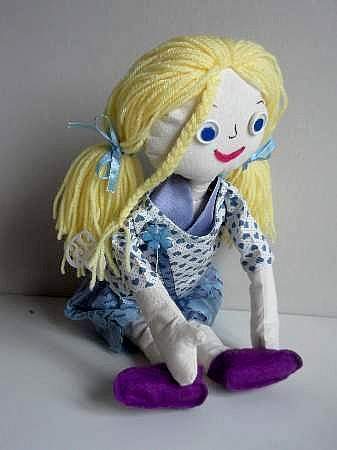 Here is how to make rag doll shoes look cute. Sew on the sequin or anything that is small and decorative, at the end where the fastening is. I used a star sequin because the color blended. Look how pleased Eleanor is with her shoes! 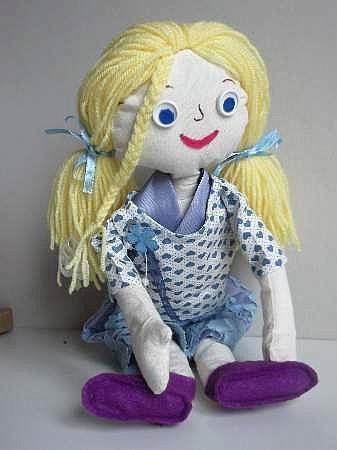 She does look dapper in her complete rag doll outfit. See what other stuff the KKC crew have been doing for their Sewing craft projects.